My friend, Karon B., and I have been playing around with different musical compositional tools. In tinkering with a site called Flat, we found we could collaborate together. So I started a “sort of” conversation (the words are mine) and invited Karon to “harmonize” with me in counterpoint. Kind of interesting to see two people collaborate on single music document, envisioning it as a thematic conversation, albeit a short one. (She had already been doing similar explorations with Twitter streams for CLMOOC). 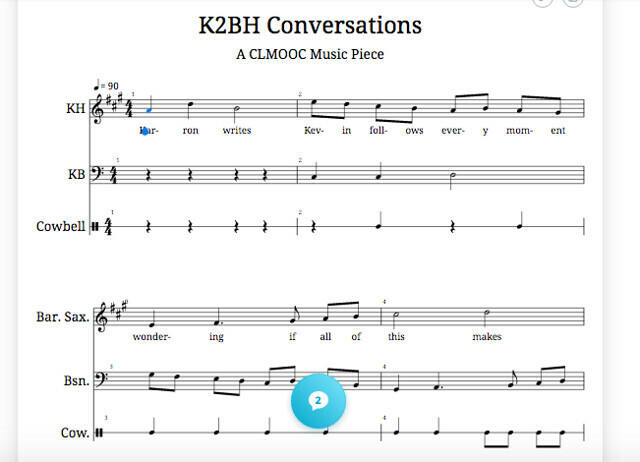 This entry was posted in CLMOOC, music. Bookmark the permalink.